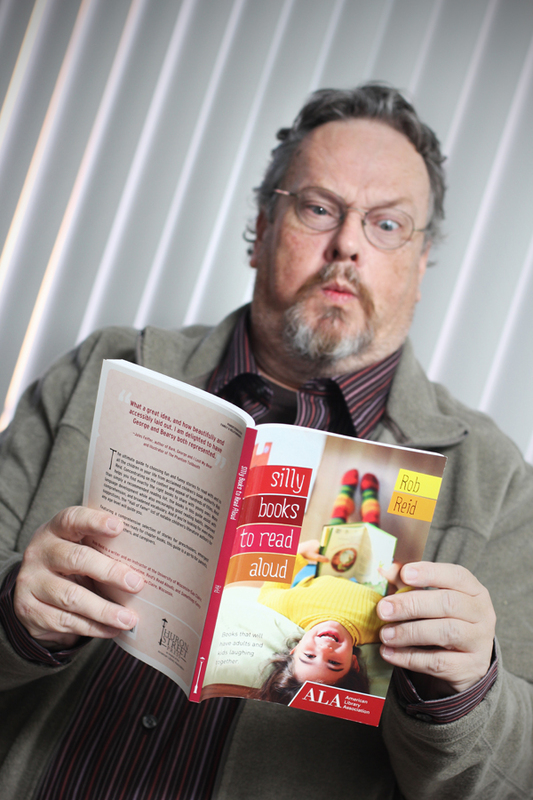 Local author and storytime ninja Rob Reid and his newest book, Silly Books to Read Aloud. Humor not only tones your abs and puts a healthy flush in your cheeks, it brings people together, teaches, and can – according to Rob Reid – get kids hooked on books. Reid, an expert on humor and a lecturer at UW-Eau Claire, has just had his third book of the past year published. Silly Books to Read Aloud is geared towards parents and highlights the best humorous stories to read aloud with your children (or nieces/nephews, cousins, students, or the wild kids you babysit). Kids respond well to humor. It traps their attention, and before they realize what’s happening, they can be learning while having fun. Silly Books to Read Aloud is a manual to help adults select books that will do just that: get kids excited about books and reading. It is no surprise that humor is the most popular genre for children when choosing books. Reid’s book is divided into five sections dedicated to various genres: picture books, easy readers, elementary-level chapter books, poetry, and graphic novels. Because humor is subjective, each volume featured in Reid’s book has its own description explaining the type of humor it offers. This way parents can choose books that are appropriate to their children. Bring it along to the library and use it as checklist when picking out your next batch of books to read! Father starts the day by scratching himself, fetching the newspaper, chasing a ball, and investigating noises. He also likes to roughhouse, lie around for hours, and ride in the car with the windows rolled down. He will also growl “when you startle him out of a nap.” He is very loyal to the entire family, which is good, because “Mom says we can keep him.” All ages will particularly find the fact that “when he toots, he looks around the room like someone else did it” amusing. Reid has loved books for a long time. He was a children’s librarian for about 20 years before he started teaching courses on children’s literature at UW-EC in 1998. He has been instructing young teachers-to-be how to identify quality children’s books and how to teach those books to children ever since. Now that Reid is putting his knowledge into books, everyone can benefit. His latest volume is published by Huron Street Press, a smaller publisher within ALA Editions. The idea for Silly Books to Read Aloud originally came from Reid’s editor. After Rob wrote two other books on humor, Something Funny Happened at the Library and What’s Black and White and Reid All Over?, his editor suggested that he write another for parents. Silly Books to Read Aloud is going to be the first book in a series. The second book is called Biographies to Read Aloud. As you can probably guess, this book will feature biographies about some famous and not-so-famous characters from history. Unlike the textbooks used in schools, the biographies included in Biographies to Read Aloud will evenly represent both males and females of a variety of ethnicities. The third book Reid will be publishing will be Animal Stories to Read Aloud. Keep an eye out for these books to add to your collection. Whether you are parenting, teaching, babysitting, or just enjoy learning about great books, Silly Books to Read Aloud is a great resource. You can find Silly Books to Read Aloud at the UW-Eau Claire bookstore or online at Amazon.com or BarnesandNobel.com.